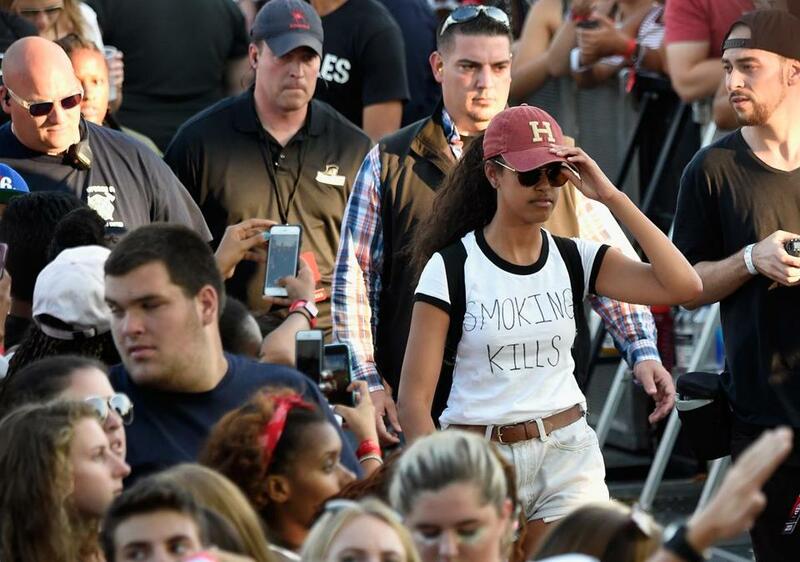 Malia Obama sported a Harvard cap at a festival last fall. CAMBRIDGE, Mass. — By the looks of things Tuesday, it was a typical student move-in day at Harvard. Volunteers with clipboards directed people to the appropriate living quarters. Large boxes were lugged up dorm stairs full of items and schlepped back down again, emptied and folded up. Music blared across the quad, adding a soundtrack to the laborious task of unpacking and settling in. It was almost as if Malia Obama weren’t on campus. Although she was. The elder daughter of former president Barack Obama moved into one of the freshman dorms on the Cambridge campus this week, officially taking her place as a member of the class of 2021. Malia, 19, was spotted outdoors Tuesday with a group of other students, chatting amid the bustle. A Run the Jewels song wafted from a nearby speaker system. She stood by a brick building, sipping water in an all-black outfit and white sneakers. Just another freshman. Nobody rushed toward her or tried to get her attention. No phones came out. When a Globe reporter walked up and asked for an interview, Malia declined, saying “I can’t,” but politely returned a handshake. She appeared again later, hamming it up with people as she clutched a folded up, neon green bag in her arms. Then she slipped back inside the building, made an apparent wardrobe change, and headed back outside again. Pictures and video of her mother, Michelle Obama, and father were also circulating online, as the former commander-in-chief was spotted dining at Harvest restaurant in Harvard Square on Monday, and Malia apparently explored the historic square near the school. Tuesday is the official freshman move-in day for the class of 2021, but some students decide “to move in a day early, based on travel schedules, athletic schedules, or other needs,” according to a Harvard spokeswoman. Malia’s arrival comes after a gap year where she spent time doing an internship in the film industry. The Obamas vacationed on Martha’s Vineyard this summer, one of the family’s favorite getaways. Her presence during move-in time had some parents talking, but for the most part, people stayed mum. Shannon and Ron Whisenant said their son, Eric, who is beginning his freshman year, moved into the same dormitory as Malia, but he is living in a separate section. She said she finds comfort in knowing that the building will probably be extra secure during the school year. Not everyone on campus was thinking about Malia’s arrival — after all, they had their own kids to worry about. The college transition is undoubtedly difficult for any parent. Sixteen years ago, Rick Marando sat with his daughter, Cassandra, at the former Au Bon Pain across the street from Harvard. He told her that if she worked hard, and hustled, she could one day become a student at the school. “And here we are,” Marando said, sitting in a fold-up chair, sipping on a Vitamin Water, and staring off at the dormitory where his daughter would be living. He was taking a break after a morning of moving. “This is a dream come true,” Marando said.